Gymnastics for All is a sport for everyBODY, regardless of age, gender or ability. It is the perfect activity to prepare children for long-term participation in sport and develops vital life skills. Our purpose is to share our high level experience with the children to improve their gross and fine motor skills, to help them learn and love sport for life, to teach them the basics of all sports and to enhance co-ordination, agility for body awareness and balance. Agnes has a Master Degree of Physical Education, and also a L3 International Acrobatics Coach diploma. She was the member of the Hungarian Acrobatics Elite Squad for 8 years, her best results are 2nd at the Junior World Championship in the Women’s Pair category, 4th at the European Championship, 5th at the Senior World Championship. 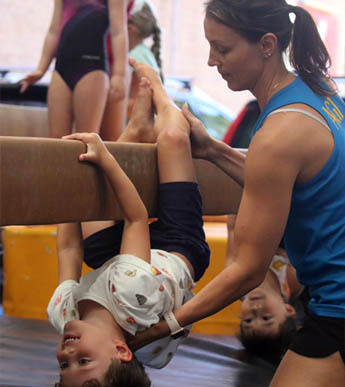 Acrobatics Gymnastics is the perfect sport to teach your child balance and co-ordination as well as sharing in the benefits of working within a team environment.